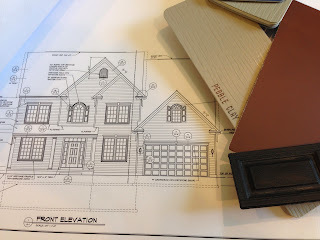 Today we met with our SR to make any final structural changes and to pick out our exterior colors. We learned we had to change our original elevation B to elevation C because the family who bought the lot across the street from our lot picked elevation B first. We were kind of bummed about this because elevation B adds two feet to your foyer and really creates a grand entrance. But elevation C is very nice and will include a porch. In addition to changing our elevation we added some additional ceiling rough-ins in the second, third and fourth bedroom and added recess lights to the study. So at this point I think we are all set with lighting, but my husband has not met with Guardian yet so there may be some more electrical changes. 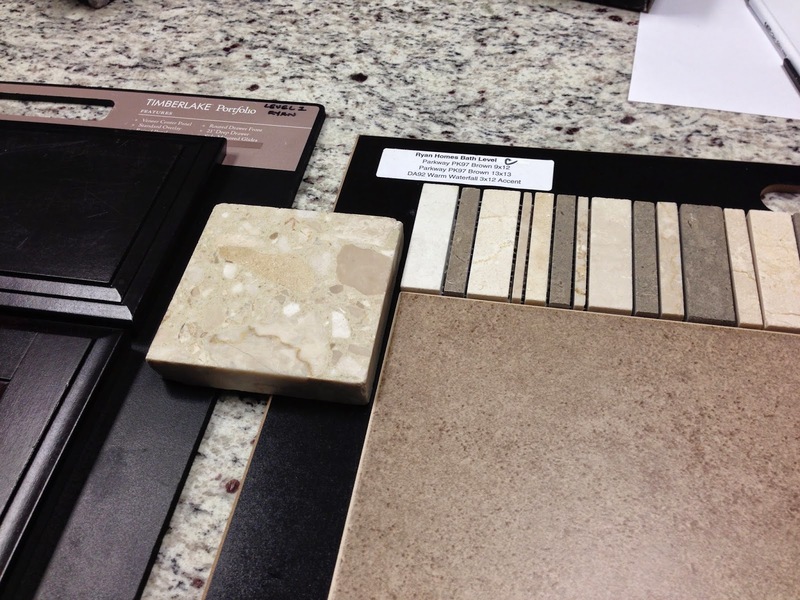 Next we met with our design consultant at M&R Flooring to pick out our tile, flooring and carpet. So I know this experience is meant to be fun, but personally I found it kind of nerve-wracking. First, our design consultant was very nice, but was definitely pushing us towards upgrading almost everything. And while I know that's her job, I found that sort of annoying. Because let's face it when everything is "just $400 more" or "just $1000 more" - the final tally is a lot, lot more. Lol! Second, and this may just be me I generally did not find that Ryan Homes offered very much variety in either their standard options or upgrade options. On the one hand I guess that's a good thing because you really can not go wrong, everything seems to work well and the palate is very neutral. They definitely have a "formula" in terms of what customers want and what is cost-effective for Ryan to offer. But at the same time I would have liked some more choices. Now I may feel this way because this is my third house and I have renovated a house in the past so I know what I like and I know what's out there at boutique kitchen design showrooms and even Home Depot. But starting with the cabinets - the cabinets I have now in my renovated kitchen are solid wood maple, dovetail construction, and soft-close. None of this is available in either the standard cabinets or the upgrade cabinets Ryan offers. Why not? Second, Ryan offers about 8 granite choices all of which I'm sure you have seen a million times in standard variations of gray, tan or black. 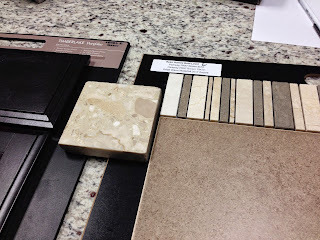 But quartz, Corian, marble, or other colors of granite can not be obtained as an upgrade or even as a "special custom" order - and yet you can walk into any Home Depot and find these other solid counter surfaces - so they are clearly things that can be mass produced. So again, why not? We picked out a very nice traditional Gunstock wood floor for our house, but it would have been nice to have the choice to pick out bamboo or more exotic wood floor choices. But that did not seem to be an option - the floors were either a choice of 4 traditional hardwood floors or 7 or 8 "engineered" hardwood floors. And while I believe it is best to keep hardwood floors simple, it would have been nice to be offered Brazilian Cherry or something more exotic. The bathroom tile options were also fairly unimaginative - everything involved a 12in tile and decorative tile border or the standard 6 in. white tile. We did find something we liked, but it was kind of hard. We decided not to pick out a kitchen backsplash and do that after the house is built. All in all I am happy with our choices and we didn't go to overboard with upgrades - the biggest upgrade for us is getting hardwood floors throughout the first floor. This is costing us about $8,000 - but it really is a non-negotiable for me. Sigh! I guess I should be grateful for these "problems". The design center is totally frustrating, there a few things I basically decided to do later on my own. So NVHomes does offer cabinets with "solid wood maple, dovetail construction, and soft-close" and "quartz". Given that they are the same company you should be able to access these items. Your SR will be resistant because of the extra paper work. You basically have to make a stink about it , but there is no reason why they can't make a special order. Thanks for the advice! I decided to go back to the design center with a less grumpy attitude, lol, and I made a few changes to my original selections. I feel better about it now.